Baking Soda for Acne and Skin – exactly how to use it! Baking soda for acne is one of the cheapest and most versatile ingredients you can use. It can be used for treating acne, reducing blackheads, brightening skin tone, zapping a pimple, smoothing skin… you name it! Baking soda may just become your new skin care “secret”! The gloriousness of baking soda for your face may come with some side effects for some people. If used too much can disrupt the top layer of skin (acid mantle) and can cause sensitivity with redness and/or irritation. Baking soda can cause breakouts for some people! This is either a “purging” or, more likely, it is from overuse which is causing inflammation – which in turn causes breakouts. Most of these side effects from using baking soda on your skin are not too extreme – if you haven’t overdone the scrubbing, recovery is simple: just stop using it for a few days. Be gentle with your skin (a good hydrating moisturizer, no exfoliation, keep away from extremes of heat, cold, wind etc), and it will be fine. If you’re worried or you just want to make sure – do a patch test on a small area before using it. Wait – I Thought The High Acidity of Baking Soda “Imbalances” skin?? Baking Soda has a high-ish pH 9 (alkaline). The skin mantle (natural surface layer sebum (oil) and sweat) is slightly acidic at around pH 5 (source). First of all it’s important to remember that it needs to be used sparingly – once or twice a week (which is the same recommendation for most other skin treatments). In other words – there was no significant difference between the two and the skin has a remarkable way of maintaining balance. Just be sensible, don’t overuse any of these methods. And if your skin gets too dry or starts to get irritated – stop completely. THIS can be the reason for why baking soda can sting. If your skin is sensitive, you may wish to avoid it. 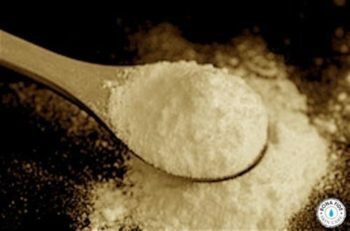 ***IMPORTANT – baking soda is soluble in water. So it is best to use it with water instead of oil etc. This takes away the harshness and makes the crystals “rounder”. The BEST way to use baking soda for acne and congested skin is to mix it with your cleanser. Baking soda as a cleanser is best for very oily and congested skin. It can be irritating to use everyday but if your skin is oily it should be able to handle it, if not, every 2nd or 3rd day is fine. Start gentle as taking your time is better than ending up with redness and irritation! Whether you experience it on a “per pimple” basis, or your whole face becomes red and irritated, a baking soda mask is a good way to soothe it. Use this mask 2 – 4 times a week for best results. 5) Apply moisturizer straight away – skin will feel tight and dry…. but look bright and very clean! Baking soda’s ability to reduce inflammation significantly makes it excellent as a spot treatment. For extra spot reduction power you can mix it with lemon juice and you have one of the best overnight pimple remedies! 3) It will harden/cake, you can remove the crusty bit but don’t rinse off – it’s still working! Baking soda for acne can be a really effective treatment, try it and see if it’s right for your skin. I’m sure you have some in your kitchen cabinet so go for it! Get rid of clogged pores and loosen blackheads to help with extraction with a baking soda mask/exfoliation. Simply mix two teaspoons of baking soda with enough water to form a paste and apply to skin. Make sure you use it with a very high water to baking soda ratio. You want it to be more like water with some baking soda dissolved in it, rather that grainy. This actually negates the need for a cleanser product unless you enjoy using one. And it also helps keep the brush clean! Baking soda can work very well for all skin types as an exfoliating and brightening treatment. To help prevent too much dryness, use it with Manuka honey – which actively brightens skin as well. Apply a paste, leave on skin for 10minutes then gently massage. Remove with warm water and repeat twice weekly. If you’re a fan of manual scrubs like the classic St Ives Apricot Scrub (which is good stuff!) you will really like this. The following mask is an amazing way to lighten any scars or pigmentation. The addition of olive oil adds hydration (olive oil is especially good for dry skin) and has extra anti aging benefits. Add a handful of baking soda to a tub of warm water and soak your feet for 15minutes. Make a paste with water and apply to extra dry areas. Add half a cup to your bath, along with one teaspoon of hydrogen peroxide and 1 cup of epsom salts. Be prepared for baby soft, smooth skin and relieved muscles! Whiten teeth – once or twice a week, mix some baking soda and hydrogen peroxide and brush your teeth for 2 minutes. Be careful to avoid your gums, and do so gently (it can be harsh on enamel so check with your dentist). This is a great DIY teeth whitener. It seriously works! Do you have a favorite use for baking soda and skin or beauty? Let us know in the comments! Love this stuff. gives a nice cool, clean feeling when out of the shower. I use this every other day, using the harder face scrub for the other days. Reading this info on acne, and specifically cystic acne has given me new hope. I’ve been plagued with acne for 50 yrs now. I’ve endured endless treatments of various oral medications (including 3 separate 9 mth treatments with Acutane), various prescription topicals, diet changes, laundry detergents, derma-brassion, laser resurfacing. Nothing has been successful at keeping acne at bay, and I have significant and numerous scars. I have (or have had) every type of acne there is, starting from age 8 yrs old on. Currently having a difficult time with severe cystic acne, which isn’t responding to the “typical” treatments of topicals and prescriptions. Hi Dee, thank you for sharing your experience. I definitely sympathize with the acne struggle, especially when you have tried what seems like everything. The biggest problem with acne is that everyone’s really is different, so while there may be similar causes across the board it never is the same for everyone. I applaud you for trying a lot, as that is the best way to find out, trial and error and learning (even though it’s frustrating!) Sometimes it really can be one thing that helps – so I do hope this remedy is successful. All the best for you and your skin! can baking soda be mixed with proactive? I’m using baking soda with lemon juice and its my 2 day. In my 2nd day it feels so smooth and clean, I will continue up until my face is pure cleanse with acne. Are you using it everyday? Is it safe ? I got pimples on my forehead but nothing on my cheeks, so can I use baking soda for that, and for how long? Thanks! is it hot water or cold water? For spot and cystic acne treatment, do I have to do this every night before bedtime? Thanks! By far the best acne treatment that I’ve used!!! I mix it with my cleanser nightly and I’ve not had a breakout in months! My face was congested and I had ‘knots’ under my skin that I couldn’t get rid of. I’ve been acne free since 1 week after adding baking soda to my routine. It took about a week to notice a difference and now my face is smooth and complexion is beautiful! Thank you so much for your comment Shae! It’s always great to hear from people who have tried these treatments, especially if it’s successful 🙂 I’m really happy your skin has cleared as I’m sure you are too! Baking soda is one among those natural remedy that effectively reduces the appearance of acne and pimples. It has antiseptic and has anti-fungal properties. Due to these properties it can help to deal with the bacteria causing acne.